Also featured in Golf Course Management. To stay on the short list of top golf courses in the country, staying on top of ongoing infrastructure needs is imperative. 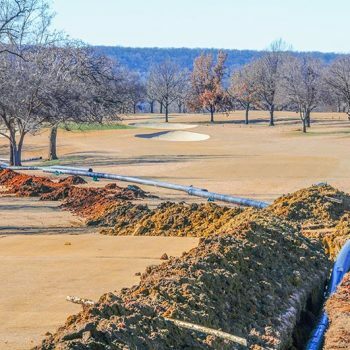 When Southern Hills Country Club in Tulsa, Okla., considered its capital improvement plans for 2015, they decided it was time to focus on water by replacing a 40-year-old irrigation pump station and mainline that feeds the entire course. This gave KD Davis, golf course superintendent, the opportunity to do what many progressive courses are doing across the country — switch to high density polyethylene pipe (HDPE). He researched and spoke with golf superintendents across the country on what would be the best pipe system for the historic major championship course and quickly learned of the solid reputation in HDPE pipe joined by heat fusion. Members are excited that we have a long-term fix in place for some of our infrastructure — something our club will utilize for years to come. “The consensus is that about 85% of the jobs are going that way — complete renovations with HDPE,” Davis said. 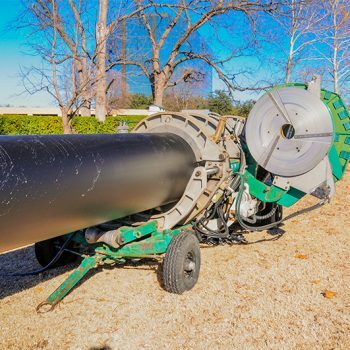 Leak-Free Joints: HDPE pipe lengths are joined through heat fusion technology which creates a seamless pipe system that doesn’t leak which lowers water costs and conserves water. Unlike other types of pipe, HDPE fused pipe has no allowable leakage allowance. Corrosion & Chemical Resistance: HDPE doesn’t corrode or rust so there are no added maintenance costs down the road to restore water flow. It’s also not compromised by other chemicals it can be exposed to underground and there are no worries about infiltration. Freeze/Thaw Resistance: While it is common for metallic pipelines to rupture during freezes and thaws, causing costly repairs and inconvenience, HDPE fused pipelines can withstand temperature extremes without breaking even when the lines are frozen solid. Trenchless Capability: HDPE fused pipe can be pulled underground and under waterways through horizontal directional drilling, slip lining and pipe bursting methods without having to excavate or disrupt the environment. 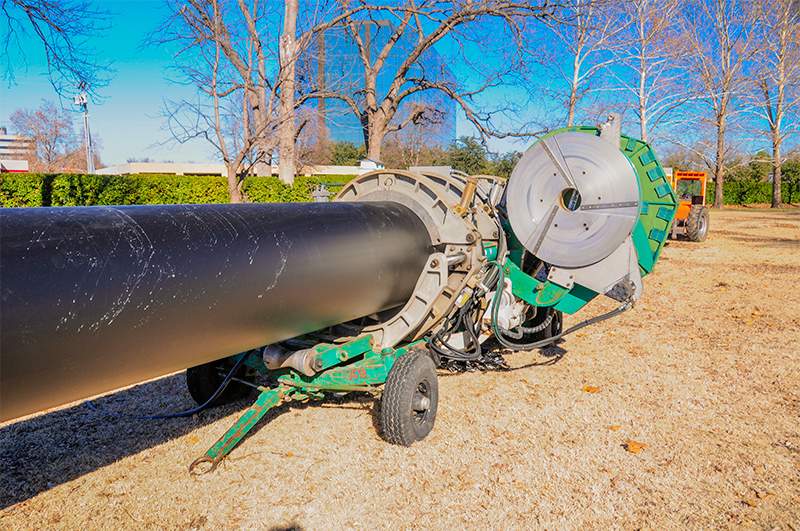 Seismic Resistance & Flexibility: Unlike pipe materials that are more rigid, HDPE fused pipe is strong and durable yet flexible and can withstand ground shifting. Studies show that cast and ductile iron lines shatter or rupture during earthquakes while HDPE fused pipelines don’t — even with magnitudes beyond 8.0. This is of particular interest in Oklahoma which has now surpassed California in the occurrence of earthquakes. A leak-free system, a 100-year life expectancy and the ability to stay intact during freezes, thaws and settling were key selling points for Davis. He also took into consideration whether his crew could do the work themselves and if they could get it done in only three months — just before spring golf season hit. 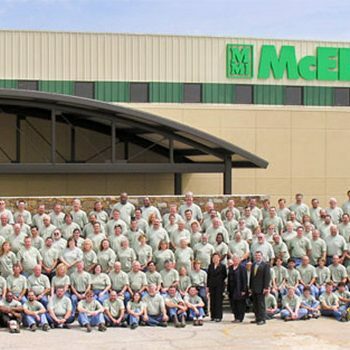 The leading maker of fusion machines for HDPE pipe, McElroy Manufacturing, offers fusion training on small, medium and large-diameter pipe fusion machines through McElroy University. Davis decided to give the training a try and put four of his team members through the course. Once on the jobsite, McElroy sent in technicians for added support. Most of the machines were rented from ISCO, a major distributor of McElroy equipment. Davis’ crew made steady progress, fusing 4,200 linear feet of 16″ to 20″ pipe and 120 linear feet of 30″ pipe for the mainline. All told, they made approximately 130 fuses in addition to digging trenches and laying pipe, finishing the work successfully before spring tee-up times. Quality control played a key role on the job. Operators used McElroy’s DataLogger® 5, a hand-held computer that records each step of the fusion process. By reviewing the records, they were able to make sure that the pipe was fused at the right temperatures, pressures and cool times. This was an especially good tool for the crew because it was their first pipe fusion job not to mention the fact that they were working in single-digit temperatures which can make fusing pipe more challenging. When they pressurized the lines once the job was complete, all of the fusions held up with no leaks. Fusion machines included McElroy’s MegaMc® 1236 and the TracStar® 500 and TracStar 630. They were able to fuse 300′ of pipe at a time in one main staging area before moving it to the trenching area where it was buried 2′ to 3′ deep. 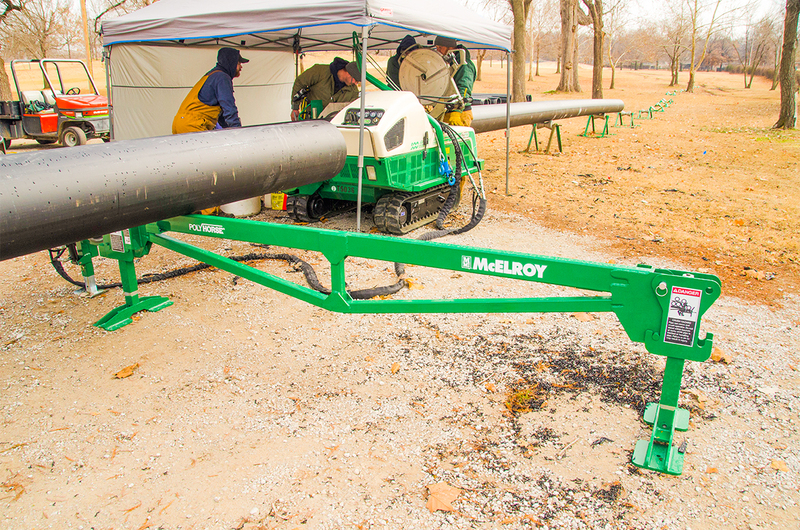 In the main staging area, the crew used a McElroy PolyHorse®, a productivity accessory that Davis said was “a must” in maintaining productivity. 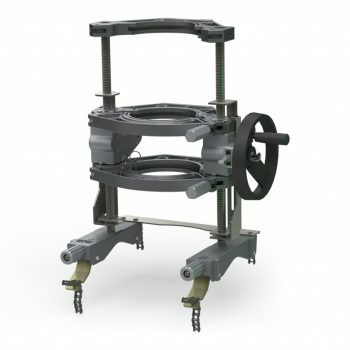 The PolyHorse® features a series of racks that holds a day’s worth of pipe. Each stick rolls down the rack and into the fusion machine via pipe rollers. Once pipe is fused, it is pulled through the machine to the other side and balanced on Low Profile Rollers. “The nice thing about the HDPE was that the pipe came in longer lengths which allowed for less fuses than traditional PVC,” Davis said. 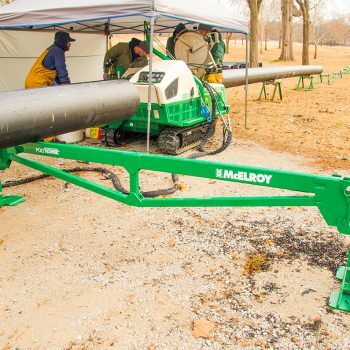 They made four tie-in connections from the mainline to the existing PVC irrigation sprinkler system using a McElroy DynaMc® 28 with an electric pump. Davis said that they plan to eventually replace the PVC with HDPE pipe as their renovations continue in the coming years. The project called for relocating the course’s old pump station to a more discreet location on the West Nine. This freed up valuable real estate for future repurposing. The West Nine Pond was drained and a new wet well was installed. The new pump station is more efficient and has the ability to monitor or adjust water quality and deliver fertilizers and wetting agents directly into the delivery system. 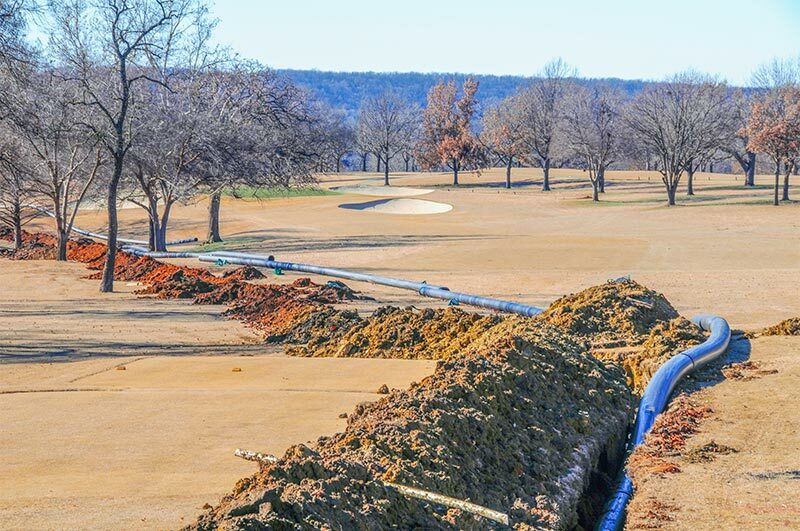 The mainline connects the existing irrigation system to the new pump station which provides water to all the greens, fairways, trees and landscaping. Southern Hills has its own water wells and supplements with water from the City of Tulsa in addition to catching rain water. The new pump station and mainline are now up and running great. “Members are excited that we have a long-term fix in place for some of our infrastructure — something our club will utilize for years to come,” Davis said.